불굴사는 신라 신문왕 10년(690)에 창건되었고, 조선 중기까지만 해도 50여채의 건물과 12암자 등을 갖춘 큰 절이었다고 전해진다. 탑은 절 안의 법당 앞에 세워져 있다. 이 탑은 2단의 기단(基壇) 위에 3층의 탑신(塔身)을 쌓아올린 형식으로 신라석탑의 일반적인 양식을 따르고 있다. 넓고 긴 돌로 탑의 구역을 마련하고, 바닥돌은 사방으로 하나씩 4장의 돌을 붙여서 짰다. 아래층 기단의 맨윗돌은 꽤 두꺼운 편이며, 돌의 가운데에 2단의 괴임돌을 두었다. 위층 기단의 가운데돌에는 모서리기둥과 가운데기둥을 새겼으며, 맨윗돌은 얇지만 그 아래에 윗돌과 반듯하게 한 단을 붙여두었다. 탑신은 몸돌과 지붕들을 각각 하나의 돌로 짰는데, 몸돌의 모서리마다 기둥을 새겼을 뿐 다른 장식은 없다. 지붕돌 밑면의 받침수는 모두 4단씩으로 줄어들었고 추녀밑은 반듯하지만 마무리 부분에서 뚜렷하게 치켜올려져 있다. 지붕돌의 네 귀퉁이 역시 완만한 경사를 보이다가 마무리부분에서의 치켜올림이 상당히 크다. 꼭대기에는 머리장식으로 노반(露盤:머리장식받침)과 복발(覆鉢:엎어놓은 그릇모양의 장식)이 남아있다. 돌의 마무리에서 정연함을 보이고 있어 탑 전체적으로 뚜렷한 비례가 돋보이는 탑이다. 그러나 탑의 규모가 작아진 점이나, 지붕돌의 치켜올림이 지나치게 큰 점, 각 부분의 밑에 새긴 괴임돌의 표현을 강조한 점 등에서 형식적인 면이 보인다. 이로 미루어 통일신라 후기에 건립된 것으로 짐작되는데, 이 시기의 탑으로는 조형적인 아름다움을 보여주는 훌륭한 작품이다. 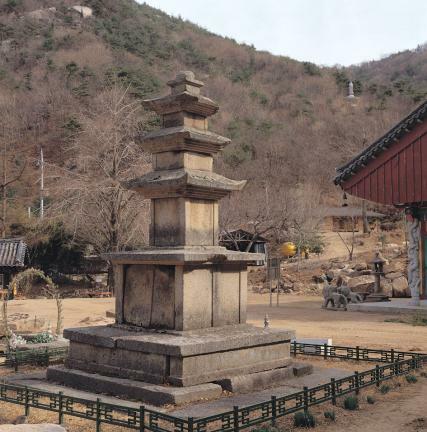 This three-story stone pagoda situated in front of the Buddhist sanctuary at Bulgulsa Temple was built in 690 (the 10th year of the reign of King Sinmun of the Silla Dynasty). It is said that it was a huge temple consisting of about fifty buildings and twelve hermitages up until the mid-Joseon period. 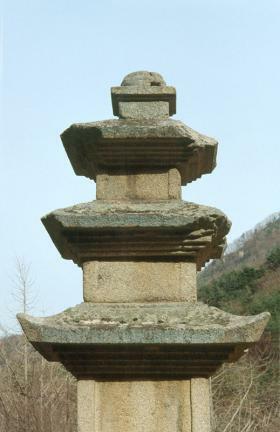 The pagoda is composed of a two-layered stylobate and a three-story main body in the typical style of stone pagodas of the Silla Dynasty. 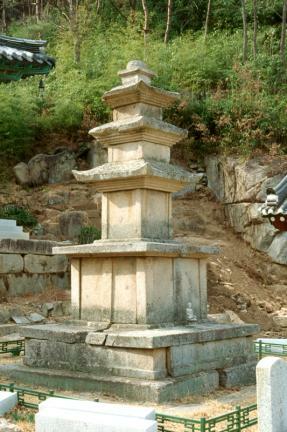 The pagoda has a large long stone for the foundation. The four faces of the bottom layer of the stylobate are hewn from four pieces of stone. The top stone of the bottom layer of the stylobate is relatively thick and is supported by two-tiered stones. The middle stone of the top layer of the stylobate is engraved with pillar patterns at its corners and at the center of each face. Although the top stone of the stylobate is thin, there is another stone plate aligned with the top stone under it. The core and roof stones of the main body are each hewn from a single stone. All the corners of the core stones are engraved solely with pillar patterns. The number of the cornices of the roof stones taper four-tiered for every story upward. The eaves are horizontal but turn sharply upward at the edges; while the four corners of the roof stones slope gently but turn considerably upward at the ends. 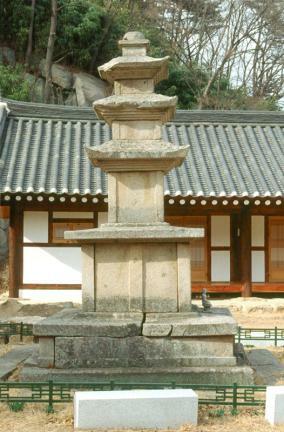 Of the upper part of the pagoda, the finial base and finial, which resembles an over-turned bowl, remain intact. 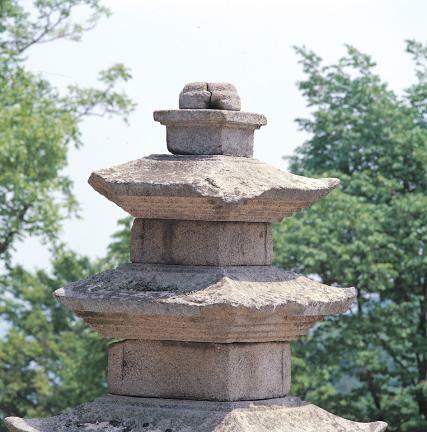 This three-story stone pagoda is admired for its beautiful composition, well-measured stone finishing and well-proportioned structure. 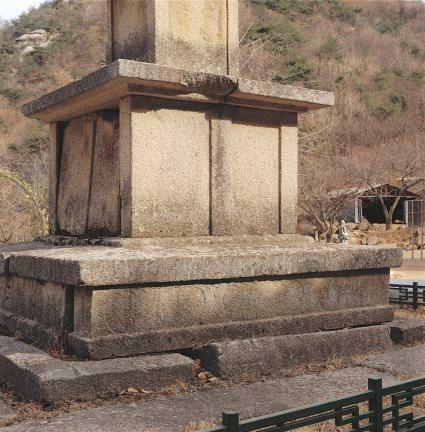 However, given that the pagoda is relatively small; the roof stones turn considerably upward at the ends; and the supporting stones carved under each part of the pagoda are distinctive, it is likely that the pagoda was erected during the late Unified Silla period.